Killer Carbon Meets lighted performance - our KillerTech™PRO bolt now comes pre-installed with industry-leading NockOut™ lighted nocks. 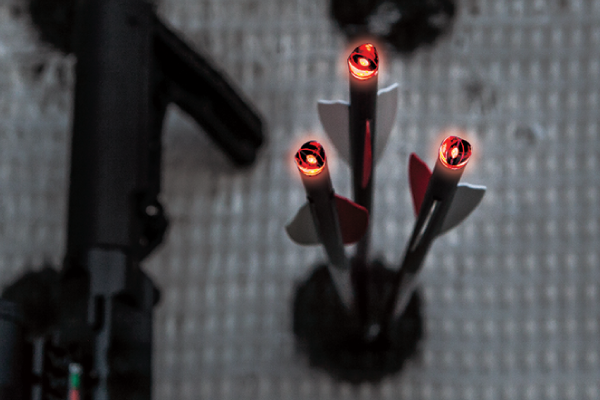 Killer Instinct® Lighted Bolts stand up to repeated use put of high-powered, high-performance crossbows - proven dependable after hundreds of shots! We are confident these bolts will exceed your expectations and improve your confidence in the field. These ‘Killer’ carbon crossbow arrows are designed for Superior Performance, delivering a perfect combination of SPEED, KINETIC ENERGY and ACCURACY. The overall weight of the arrow including a brass insert for optimal F.O.C. maximizes accuracy without loss of speed or energy. INNER/OUTER DIAMETER: .300” / .346"
These bolts work with MOST ALL major manufacturer crossbows, however, review your Crossbow Instruction Manual to determine compatibility and for overall safe use of carbon arrows prior to use. CAUTION: INSPECT EACH ARROW FOR INTEGRITY BEFORE EACH SHOT.